Kerry Wells, a college journalist and committed Christian with an effervescent personality, has been assigned to do a story on Blake Truman the college's newest and very popular hockey superstar. As a relationship between them begins to develop, Kerry finds that Blake, who hides behind a tough and independent facade, is actually struggling through a difficult personal crisis and that he bears the cross of a secret he has kept hidden for years. Blake rebuffs Kerry's suggestion that prayer might help ease his burden; he is convinced that modern science completely disproves the Bible, especially the opening verses of Genesis. Kerry -- who is herself suddenly confronted with a challenge to her faith on another front -- sets out to prove that science and Genesis are not in conflict and her quest leads to a startling revelation. 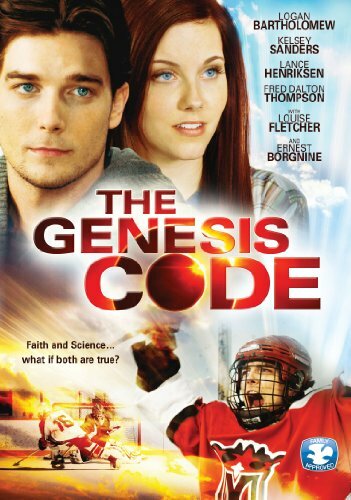 Faith-friendly, wholesome and perfect for family viewing, The Genesis Code asks whether or not faith and science can co-exist in an intriguing drama. Endorsed by pastors, professors, youth leaders and ministry groups across America, the film, directed by C. Thomas Howell, builds a discussion around faith and science, prayer and belief, and the reality of God working in the world today. With a star-studded cast, including Logan Bartholemew, Kelsey Sanders, Lance Henriksen, Fred Dalton Thomas, Catherine Hicks, Ernest Borgnine and Louise Fletcher, this provocative film is a must-see, no matter your beliefs! Kerry Wells (Sanders, The Blind Side, "Mad Men", "iCarly"), a college journalist and committed Christian with an effervescent personality, has been assigned to do a story on Blake Truman (Bartholomew, "American Wedding, "CSI: New York") the college's newest and very popular hockey superstar. As a relationship between them begins to develop, Kerry finds that Blake, who hides behind a tough and independent facade, is actually struggling through a difficult personal crisis and that he bears the cross of a secret he has kept hidden for years. Blake rebuffs Kerry's suggestion that prayer might help ease his burden; he is convinced that modern science completely disproves the Bible, especially the opening verses of Genesis. Kerry -- who is herself suddenly confronted with a challenge to her faith on another front -- sets out to prove that science and Genesis are not in conflict and her quest leads to a startling revelation. Could it be that what science teaches us about creation and the Story as told in Genesis are both true and in perfect accord?